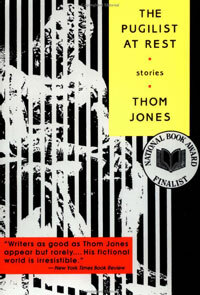 Thom Jones is the Oliver Sacks of hard-boiled fiction. He writes stories of burnt-out soldiers, fighters and tough guys with neuropsych disorders -- bipolar, seizure, personality and fugue -- in a voice somewhere between Ernest Hemingway and Charles Bukowski. How appropriate, then, that I just read The Pugilist at Rest having forgotten that I'd read it before. I was several stories into it before the memories came back. It held up to a second reading quite well. Maybe I'll forget and re-read his second collection, Cold Snap, next.